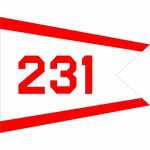 US Navy Command Burgee's are used by the commander of a division of ships or craft or a major subdivision or group of an aircraft wing. It is white with red stripes on the upper and lower edges and the number of the command in red Arabic numerals. 4	 3' 5"	 4' 6"
8	 1' 2"	 1' 6"